Curved binding is perhaps one of the hardest things I have ever done in the quilting world...and then I found out that it is not all that hard, just a bit tedious and time consuming. Here’s the step by step (with photos) tutorial on how to do. For this tutorial, I just used a piece of FMQ practice sandwich that I was working on last week, and I just trimmed it in the same curve as my bali wedding star. As you know, the Judy Niemeyer Wedding Ring series quilts all use the same curve, so you can use this on any of them. So let’s get started. If you are doing a different curve, you will need to make a different template. For this process, the light teal is the front, and the navy is the back of the quilt. Let’s start by making your template that you will use near the end of this activity. It’s just easier if it is already done. So, here’s how you make it. You will need a piece of mylar template plastic, I actually prefer a colored plastic, rather than clear, but frosted will do it a pinch, and I didn’t have anything but frosted so I made mine in frosted. Secondly, you will need to decide what size your binding will be. I like 2 ½ or 2 ¼ inch, either one is fine, it’s your choice. Take the size of your binding, and divide it in half. Cut a piece of mylar at 1 ¼” wide by about 3” long. Now, make some markings on your mylar. The first mark is at ¼”. and should go from the top to the bottom of the mylar piece, parallel to the long edge. The second mark is at ¼” as well, and runs parallel to the smaller edge. And now the hard part. If you are a visual person, please refer to the picture...because this description might make you more confused. Measure the half way point between the 1st mark, and the opposing edge, along the ¼” drawn line…..
Now draw another pair of lines...both originating at the point established in #7 above. One goes to the intersection of the original ¼” mark and the top edge, and one that connects to the opposing edge. Basically, you will have a V across the top. Now, make your bias binding….First, cut a large square. In my case, I made a 36” square. Cut your 1 yard piece, and then fold it up from bottom right to upper left until the left edges are lined up. Once it is lined up, cut off the piece at the top (which is not part of your square. Now fold the lower left hand corner to the upper right hand corner. You will have a large triangle, which has 4 layers of fabric, and each of the folded edges are on the bias. If you are right handed, trim off the left folded edge, if you are left handed, trim off the right folded edge. Now, cut your 2 ½” strips from your original trimmed edge. each of these strips is on the bias, now sew them together like regular binding and finally, once you have all of your binding in one length, press it in half wrong sides together. Now, you have all of your supplies ready to go, and you are ready to get started. First, leave a 10 inch segment of your bias binding loose, and start in the middle of the high point in your binding. Line up the cut edge of your binding to the edge of your quilt, and mold the binding around the curve, sewing a quarter inch from the edge of the quilt. As you approach the V-corner, put your ruler at the intersection and mark the binding at a quarter inch in. Sew to this point. and backstitch 3 stitches. Now, the hard part. Cut an 1/8" snip in the binding only, from the inside edge of the binding. Now move the binding over and re-align it with the next curve. 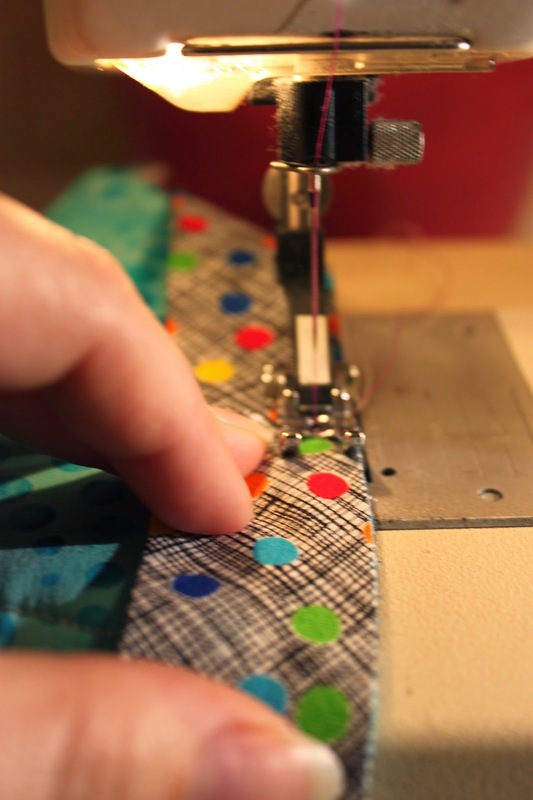 Pin it in place, and restart your sewing where you stopped the previous round. And now, the piece that makes it all work....the template. Fold the quilt right sides together and line the template up and mark the V from the template onto the fabric. now, sew on the V that you just marked., and then cut out the V using an 1/8" seam allowance. You will be trimming out a tiny V Literally tiny. But it makes all the difference in making the binding lay flat on the back. Now go back to the front, you will now have a pleat in your binding.....Now go all the way around the quilt repeating this procedure at each and every dip (that's the tedious part that I mentioned earlier). Now, turn over to the back, and pin the pleat of the binding to a point a 1/4" in from the interior point of the quilt. Now, use your Roxanne's glue baste it glue to secure the binding until you can complete the hand sewing.